“I often use creative visualization to get inmates to look at personal issues,” writes correctional deputy Carla Wilson. She believes in helping inmates, not just supervising them. 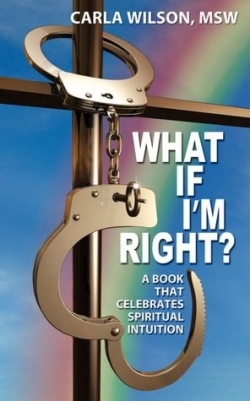 As Wilson writes about the development of her relationship with God and the difficulties and rewards of working in the correctional field, she stresses intuition, which she attributes to God. The title refers to that intuition. The latter portion of the book fills a need for recovery information by providing suggestions for former inmates, their families, their friends, and correction workers, with emphasis on addiction and alcoholism. This book is most suitable for Christians in the above-mentioned categories who believe in guardian angels. Wilson advises readers to share addiction issues—either their own or someone else’s—in twelve-step groups such as Alcoholics Anonymous, Narcotics Anonymous, Al-Anon, and Nar-Anon. A resource section briefly describes websites—mainly for former inmates—such as ExOffenderReentry.com. Wilson, who has a master’s degree in social work and is certified in mental health therapy, has been a correction deputy in Ann Arbor, Michigan, for nineteen-plus years. She also works part-time at Dawn Farm, an addiction treatment center, and runs a recovery website called The Connection Principle. What If I’m Right? is her first book. Previously, she contributed to Serving Productive Time: Stories, Poems, and Tips to Inspire Positive Change from Inmates, Prison Staff, and Volunteers. She has received many awards for her criminal justice work, including the 2005 Washtenaw County Excellence in Innovative Service Award. Wilson makes many important points, such as writing that noncompliance and various mental disorders appear similar. She reinforces certain key points—the benefits of volunteerism, for example—by mentioning them several times. However, her use of repetition is over played when she includes the same paragraph twice about Alcoholics Anonymous and Narcotics Anonymous’ premise that willpower doesn’t work. The information about Wilson’s life in the early part of the book is confusing because it is non-sequential. A chronological presentation, with only occasional flashbacks, would have been clearer. Several issues need better explanation. Wilson writes that “yes” answers may indicate a need for adjustments to one’s disposition, attitude, and belief system. She fails to explain why respecting personal journeys is undesirable. Additionally, it isn’t clear if a full-page black-and-white drawing of Wilson is the work of an inmate discussed in the previous pages. Comments about each of the twelve steps of Al-Anon begin with quotes, for which Wilson fails to indicate the source. The book also has a few typographical and similar errors. Wilson’s intuition led her into work that enables her to make a difference. She believes in treating inmates with dignity, and she is right.